Why choose Lisa Matthis Newborn Photography? When choosing a photographer it is really important to choose someone whose images speak to you… Images you feel you connect with. If my work does that to you, then I would love to tell you some ways that I make sure you are getting the best. *I take my time every step of the way. Sessions can be anywhere from 2 hours to 4 hours. I never rush to end a session. It just happens naturally when I know I have the images I am looking for. I spend, in total, anywhere from 20-30 hours on your session between the planning, preparation, the shooting, the editing, the proofing, the ordering, and more. *Safety is most important to me. I will never put your baby in danger. I have a fully trained full time assistant to make sure your baby has someone watching her/him every second of the session. *Quality… not quantity. It’s an investment that will last forever. Each and every image I treat as a piece of art…each given time and care. Each client is seen as important and each order is treated like a gift. All my products are printed on high quality professional paper. What is the ‘Session fee’ for? Newborn sessions are charged at a fee of $200. This amount serves as your newborn deposit as well. It covers my assistant fee (for safety I employ an assistant who is totally devoted to keep your baby safe at all times), the creative fee, the use of all my props and equipment (I have spent thousands of dollars on top of the range, high quality newborn props to make your images perfect), as well as the time in the studio. Included in this is 25-30 beautifully hand edited images presented in a password protected online viewing gallery. This fee does not cover any prints or digital images. How do I schedule a newborn session? We encourage you to reserve your newborn session before baby is born if possible, so that you are not disappointed and get a spot on our calendar. Email or call us with your due date, and we will send you a Paypal request for the sitting fee/deposit. Once the deposit is received, we will send you a “temporary date” and add it to our calendar. As soon as baby arrives, give us a call or shoot us an email and we will confirm a “permanent” date for your session. There are times where we may be able to fit in last minute inquiries, so don’t hesitate to call anytime! Why are newborn sessions scheduled within the first two weeks of life? Why are newborn sessions so long? Newborn sessions are usually about 4 hours . This gives us time to cuddle, feed, change and settle baby when he/she needs it. I always take my time with newborns. I will never rush a session and take as much time as we need, allowing your baby to be my guide. After every pose, your baby will need to be moved, wrapped/unwrapped in order to change the set up. During this time, baby often wakes up and needs to be soothed back to sleep, or fed. Newborn sessions can typically therefore take hours to complete. My aim is to have you feeling completely relaxed and enjoy every moment of your session. Where do newborn sessions take place? 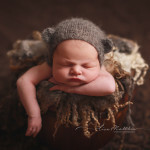 All newborn sessions are done at my home studio in Peachtree Corners, GA. All of my props, set ups, back drops, as well as lighting and temperature control is just perfect for baby to be cozy and to sleep beautifully. Glass doors separate the studio and parents area. You will be able to see your baby at all times, and are welcome to pop into the studio to peep. Knowing that your baby is being taken care of, I would love you to use this time to relax, watch some T.V, use the Wifi… and sleep. What days do newborn sessions take place on? Newborn sessions take place during week days. What time do sessions begin and end? What do I need to bring to our session? *We want to capture them just the way they are so don’t worry about bringing any clothes or props (unless you have something special you would like me to include in a picture). I provide all props, wraps, buckets, headbands, outfits etc. Do you include family and siblings in newborn sessions? Absolutely! We encourage parents and siblings to be included! Timeless clothing in organic colors lend themselves to beautiful photographs. I recommend soft, neutral colors (creams, greys, taupes) to keep the focus on baby. Try to avoid busy patterns. How do I prepare baby for the session? It is important to try to keep your baby awake for 2-3 hours before the shoot – if necessary try a cool facecloth, or a bath is a great way to delay sleepiness. (Keeping baby awake will ensure that baby is sleepy enough to get the maximum benefit of the photoshoot). Immediately before leaving home to come to the studio, give baby a FULL feed – you can top up when you arrive. This will help baby remain peaceful and sleepy throughout the session. If your child is breastfed & needs to feed we will happily break for this. If however you are comfortable to use a bottle of breast milk or formula for the session, please bring it with as it makes the session easier. Why is the studio so warm? Newborns have a difficult time regulating their own body temperature. To keep them comfortable with no clothing on it is important to keep the studio warm. I keep my studio between 85F and 90F. At this temperature it is nice and warm for the baby and he/she will likely sleep more soundly. Where will I be while my baby is being photographed? Our ‘studio’ is next door to the parent sitting room. Glass doors separate the two, so you will be able to see baby at all times. Generally we would request that you sit in the parent area and come through to the studio whenever you want to take a peek. The reason for this is so that we can keep your newborn peaceful. Sometimes if they smell mom, or hear you it makes them restless and harder to pose. We have a lot of experience with babies so you can relax and enjoy a break! If there is any problem or we struggle to settle your baby we will definitely call for your assistance. The session takes 3-4 hours so please bring reading material etc. You’re also welcome to sleep! What do parents do during the session? What is an on-line gallery and how does it work? Your newborn gallery is a private gallery I set up for you on-line. All of the edited photos I select from your session will be in the gallery. These images are for you to see how beautiful your baby is, and toy choose your prints or packages from. The gallery is password protected so that you can decide whether or not you would like anybody else to view it. Feel free to pass the password on to family and friends if you so wish. All the images in the gallery will be included in the USB/download if you purchase the high res images.